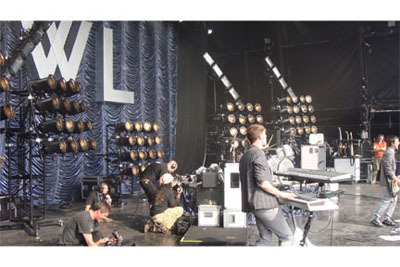 GLASTONBURY, U.K. — HSL is supplying a specials package for LD Chris Megginson and the U.K. indie rockers White Lies’ current European festival tour, which was augmented for the band’s appearance at Glastonbury 2009. Megginson went to HSL to help design a rig that was quick to install in the 20-minute changeover for their Friday afternoon slot on Glasto’s Other Stage, needing to make an impact in daylight. The band also played the second-to-headline slot on the John Peel Stage on Saturday night with a modified version of the rig, plus a set in the Guardian Tent on Sunday. The Other Stage lighting rig was built from five sections of vertical A-type truss towers — two meters in the center, 2.5 for the next two and then three meters s for the two offstage ones. All were placed upstage and gently curved around the backline for an arc effect when viewed from the front. These were mounted on HSL’s own X-bases, then simply wheeled onstage and secured in place with screw-down pads. Eighty PAR 64s were rigged in square arrays on the towers facing downstage. Above the PARs on the four outer towers, were 20 Martin Atomic strobes rigged on 4 IWBs and clamped at alternate 45Ã‹Å¡ angles to draw people’s eyes to the flown scenic “WL” insignia used as a backdrop. Six Redheads and six PAR 30s were used for lighting the band close up from the risers. The PAR 30s were fitted with 240V 75W lamps, allowing them to be run straight off the dimmers without transformers, minimizing the chance of noise across the audio. Two HSL techs — Andy “Paris” Hilton and Tom Wright — crewed at Glastonbury and HSL’s Tim Fawkes project managed. “ We came up with a quick-to-rig, cost effective solution for the design maintaining the aesthetics of Chris’s rig which worked extremely successfully,” said Fawkes. Megginson merged the White Lies Glasto rig with his existing festival rig and the Glastonbury ‘house’ systems, and ran the show from Hog PC running on a laptop complete with a programming and a playback wing attached. “Thanks to Other Stage stage manager Chris Fitch for accommodating all our extras — it’s very unusual for a band to bring on that much kit for a daytime set,” he said. “White Lies’ Glastonbury weekend was a huge success, in no small part down to the hard work and support given by the wonderful team at HSL,” he added. For more information, please visit www.hslgroup.com.